We strive to make shopping easy with our warm customer service and user-friendly website. Our traffic and tire spike systems are of the highest quality, built to endure the test of time. Receive free custom quotes & consultation specific to your business. Call us to speak to someone who can help! Browse our site full of resources, or call us to speak to a member of our friendly staff. We strive to make it as easy as possible to find the traffic spikes that best meet your needs. We will send you a custom and competitive quote that includes the traffic spikes as well as the necessary accessories needed to fully install. We work with businesses small and large, and will work to get the spikes delivered ASAP and inaccordace with your schedule. It can be quite intimidating searching for a product like traffic spikes, because they are something that most people are not very familiar with. As a result of this, when the need arises for them it can be hard to know where to turn. That being said, we try and make the process as simple as possible. With a brief understanding of what your goals are and what you are trying to accomplish, we will strive to help you find a system that meets all of your needs. Today control spikes are used throughout the globe controlling access to or from facilities such as power plants, prison complexes, airports, hospitals, colleges, gated communities, national parks, rental car facilities, corporate campuses and even homes. 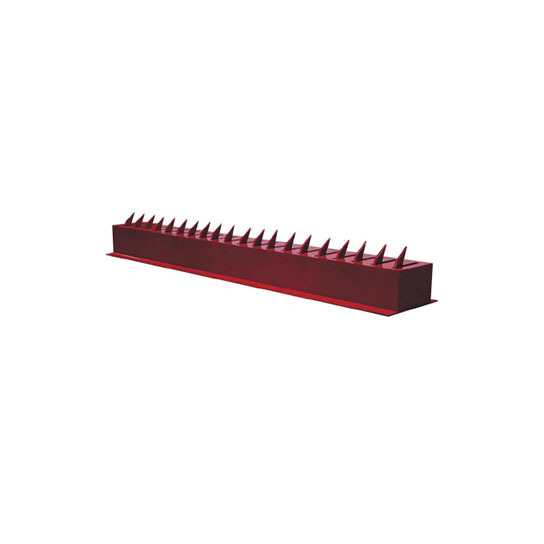 We offer traffic spikes that are both 1/4″ and 3/8″ inch thick. 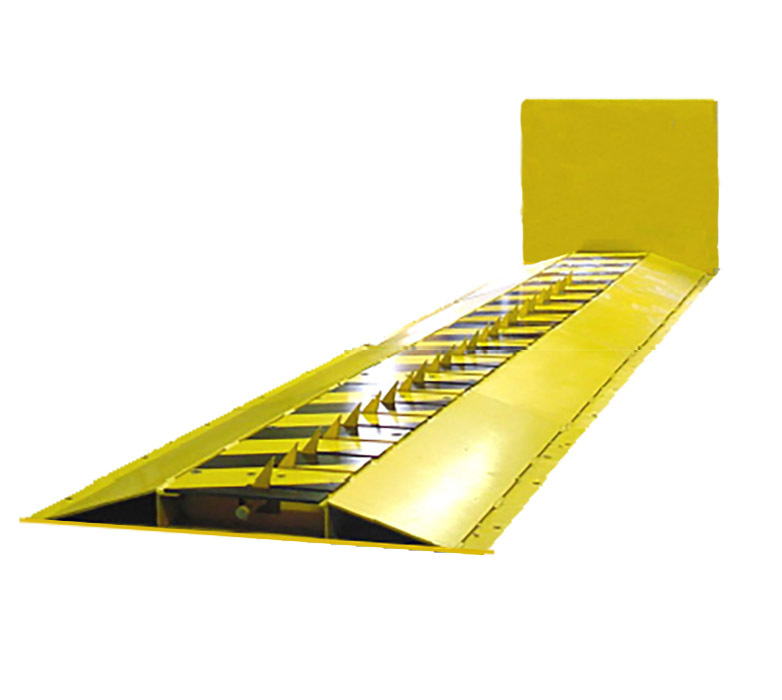 The thicker 3/8″ model is built to handle high traffic volumes of heavy load vehicles. We typically advise customers that if they expect most of the traffic to be semitrucks and the like, then they might want to opt for the heavy duty model. The 1/4″ model is also made of hot rolled steel so is more than capable of handling occasional heavy loads such as trash trucks etc. Live near the coast? 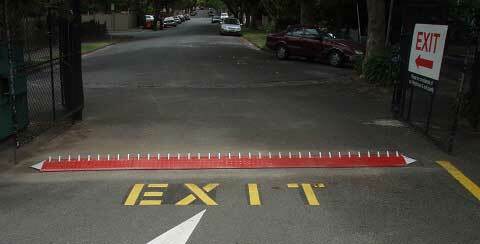 If so then we offer galvanized spikes to prevent rusting. Metal is galvanized by adding a thin layer of zinc to its surface. The zinc forms a barrier between atmospheric oxygen and the underlying iron or steel. 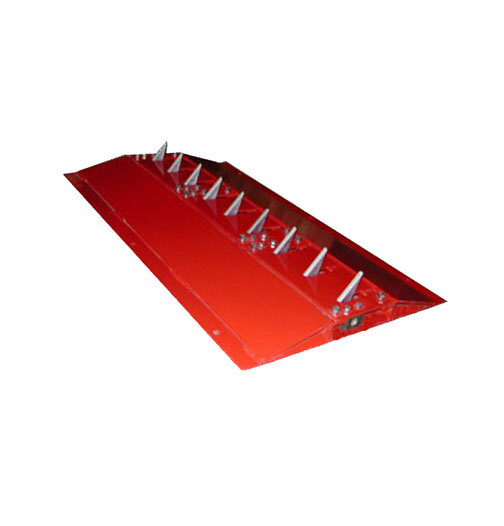 Traffic spikes are commonly sold in 3 foot sections. From experience the average traffic lane is about 9 feet, meaning for every lane, 3 traffic control modules is necessary. We recommend measuring out the length of the lane and consulting us though before ordering. 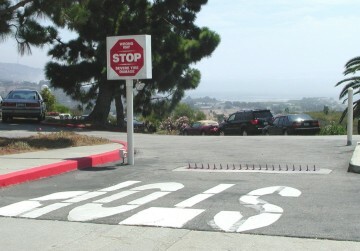 Surface Mounted (On-Ground) spikes are the the most popular traffic control and parking lot spikes we offer. 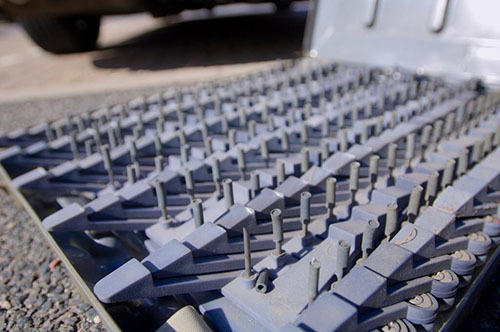 Vehicles are able to easily drive over the traffic spikes in the desired direction, but offending vehicles trying to cross over the spike strip in the opposite direction will have their tires punctured. They are extremely easy to install, and can be bolted or glued down, without any excavating or trenching required. 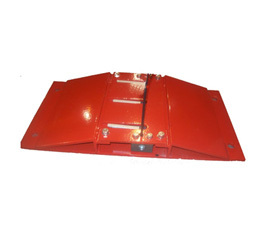 All of our surface-mounted road spikes include a latch-down option that allows uninhibited bi-directional traffic flow. 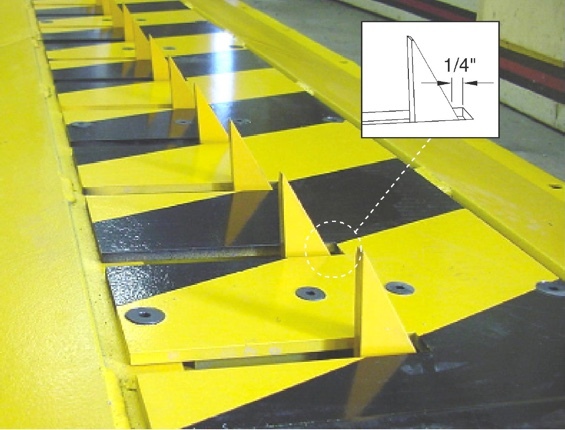 In-Ground spikes are most often installed in commercial settings, because of the large amount of vehicles expected to use the secured lanes. 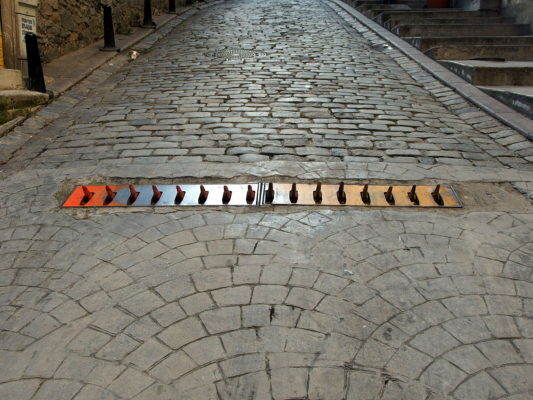 They are similar to our surface mounted road spikes in that they regulate one-way traffic flow, but are mounted in the ground for a nice, aesthetic looking finish. 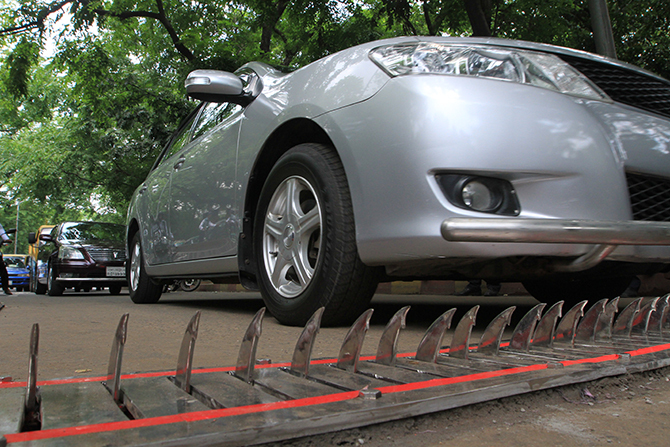 They also come with a latch down feature, which allows users to lock down the spike teeth, therefore temporarily allowing vehicles to safely travel over the strip in both directions. 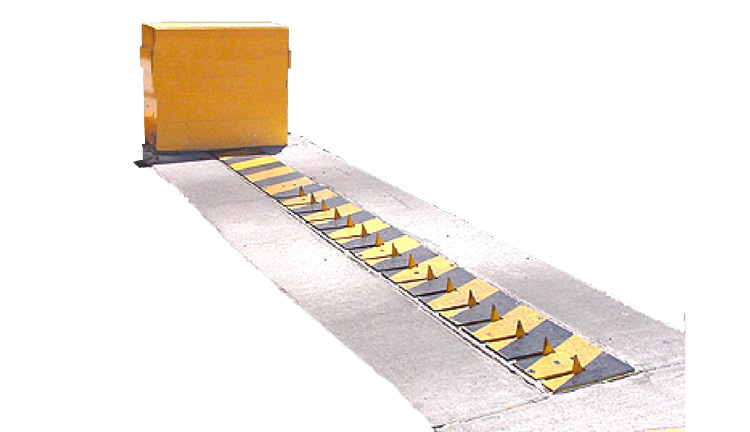 Motorized traffic spikes come in both surface-mounted and flush-mounted options. They act to regulate both incoming and outgoing traffic flow through a secure control-point, and protect against unauthorized vehicles entering/exiting a secure area. 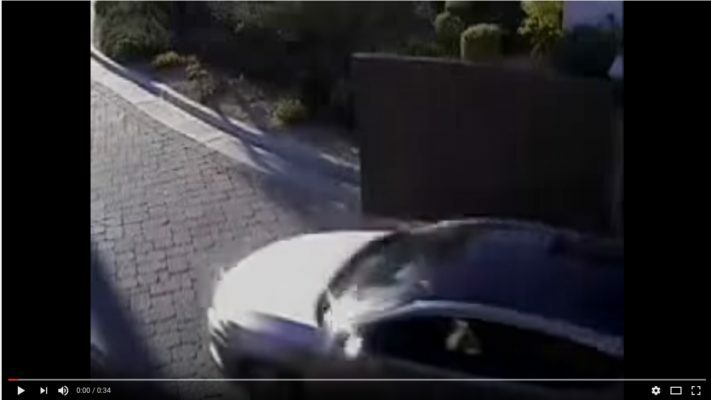 These types of spikes are commonly paired with other forms of access control systems, including parking barrier gates, swing gates, and slide gates. They can also be hooked up to a sensor for complete automation without the use of a personal attendant. The hydraulic system in our motorized tire spikes provides years of worry free operation. There are many different ways to regulate the flow of vehicles (cars, trucks, SUVs), all of which have unique advantages. The most common form of traffic control involves hired personnel, called Traffic Controllers, who physically direct vehicles away from or around a secured area for the overall safety of pedestrians. This type of traffic flow is very unpredictable, which is why it is typically seen in construction settings and after auto accidents. However, as technology has continued to progress, there have been many tools developed to manipulate vehicles without the use of hired personnel. Most of this equipment falls under the access control category; access control meaning the limitation or restriction of automobiles into certain places at certain times. 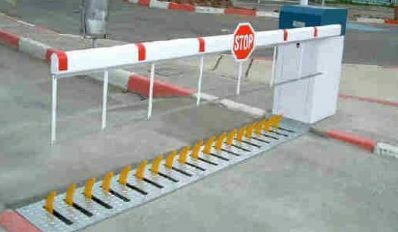 This equipment includes, but is not limited to, traffic control spikes (commonly referred to as tire poppers and traffic spikes), parking barrier gates, traffic and parking bollards, speed bumps, and sliding gates. All of this equipment is designed to limit a vehicles capability to some extent, often in parking lots and garages. When parking lots are going to be used as a revenue driving source, there is complementary equipment that can be used to assist property owners in collecting the fee assessed for parking for a specified period of time. This type of equipment includes ticket machines, token vending machines, and parking pay stations. The types of environments where this type of equipment might be used is endless, but some of the most common areas we see include corporate parking lots, gated communities, shopping centers, military bases, manufacturing plants, schools, private property, and other public areas. We have been ordering security and traffic control equipment from Coyote for over 8 years now. They are extremely easy to work with and overall just nice folks. We have requested multiple quotes from different vendors. John was the only person who quoted us what we actually needed, instead of trying to make an easy buck.